A chunk of ice half the size of Jamaica which is breaking away from West Antarctica is now attached to its parent ice shelf just by a thread, scientists reported Friday. Covering 5,000 square kilometres (1,900 square miles) and nearly 100 storeys deep, the formation is poised to snap off from Larsen C ice shelf, creating "one of the largest icebergs ever recorded," the researchers said in a statement. A widening rift running the length of the finger-shaped, 350-metre (1150-feet) -thick ice block grew 10 kilometres (six miles) longer some time during the last three weeks, satellite images revealed. "The rift is likely to break off in the next few months—if it doesn't, I'll be amazed," said Adrian Luckman, a professor at Swansea University in Wales, and leader of Britain's Project Midas, which tracks changes in West Antarctic ice formations. "It's so close to calving that I think it's inevitable," he told AFP. In late December, the rupture had already extended by 18 kilometres (11 miles), leaving the future iceberg connected along only a small fraction of its length. Just by itself, the gargantuan ice cube will not add to sea levels, the consequence of ice sheet disintegration that most worries scientists. The real danger is from inland glaciers. Ice shelves float on the sea, extending from the coast, and are slowly fed by glaciers from the ice sheet on land. They act as giant brakes, preventing the glaciers from sliding directly into the ocean. The West Antarctic ice sheet, where Larsen C is located, holds enough frozen water to raise global oceans by about six metres (20 feet). If the glaciers held in check by Larsen C spilt into the Antarctic Ocean, it would lift the global water mark by about 10 centimetres (four inches), the researchers said. 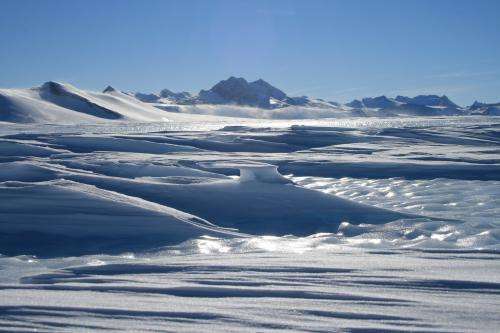 Recent studies have suggested that climate change may already have condemned large chunks of West Antarctica to disintegration, though whether on a time scale of centuries or millennia is unknown. The breaking off, or calving, of ice shelves occurs naturally. But global warming is thought to have accelerated the process. Warming ocean water erodes their underbelly, while rising air temperatures weaken them from above. The ice block currently separating from Larsen C contains about 10 percent of the ice shelf's mass, Luckman said. "We are convinced—although others are not—that the remaining ice shelf will be less stable than the present one," Luckman said in a statement. Man-made global warming has lifted average global air temperatures by one degree Celsius (1.8 degrees Fahrenheit). The world's nations have undertaken in the Paris Agreement, inked in the French capital in December 2015, to cap global warming at "well under" two degrees Celsius (3.5 degrees Fahrenheit) above pre-industrial era levels. All for Renewables, Now ! We Need to change the earth to it's natural state with clean air for Everyone to breath ! We have Deniers who allege that adding ice to the oceans will make them go lower. It's beyond amusing that the only place that AGW Cult FAKE "science" can find their magical CO2 at work is West Antarctica, where there is extensive geothermal and seismic activity. There is no logical contradiction between both geothermal/seismic activity contributing to the melt and CO2 contributing to the melt i.e. the two aren't mutually exclusive. To suggest otherwise is just being stupid. There is no AGW 'cult' and climate science isn't 'fake' and it isn't 'magic' that makes CO2 warm the climate but basic physics the average halfwit can easily learn at school. These floating ice shelves were already buoyant prior to becoming separated. The volume remains constant. In other words ... Those floating ice cubes in your soda glass do not make the liquid level rise or lower when melted. It stays the same. I would expect a better understanding of science from a Master of Science like yourself. rich, I was referring to one of your fellow Deniers who maintained just such a thing. He asserted since it contained air, and was less dense, then when it broke off, even the stuff sliding off the land would make the sealevel lower, not higher. Who was that, . . maybe benni? But any halfwit knows that our CO2 and Methane are "greenhouse gasses" and that dark sea replacing melted white ice also increases the solar heating. But then I guess I'm not addressing just any halfwit but a wilful, intentional, halfwit. "A widening rift running the length of the finger-shaped, 350-metre (160-feet) -thick ice block." This has to be wrong - or what am I missing? My calculator says 1148 feet rather than 160. If that floating ice melts (and note when an ice shelf breaks off, it then melts more rapidly), that means less white ice cover on the oceans to reflect solar radiation back into space and therefore more solar radiation gets absorbed into the ocean water therefore contributing to warming of climate therefore causing warming of the ice over land due to warmer maritime air blowing from ocean to over land therefore causing greater melting of ice over land therefore contributing to sea level rise. "As of this moment, all references to climate change have been wiped from http://WhiteHouse.gov #USofScience"
Your message is implying rising ocean levels. You also said "adding ice" which is not what is going on here. Anyhow, the AWG crowd always speak of rising ocean water levels and their cause. But on the bright side, with the thawing of the antarctic it opens the possibility to make it easier for oil exploration and cheaper fuel for all which will raise the standard of living of everyone and bring more people out of poverty. Uh huh. It's more like moisture laden air blowing over frigid land and falling as snow, thus reducing sea levels. Uh huh, just like there is no contradiction between the empty space between your ears and your utter stupidity. Why isn't the ice breaking apart all around the Antarctic. Is CO2 so particular that it hangs around only the West Antarctic to be near the volcanoes and earthquake. On the topic of Antarctica and its Climate. During Operation HIGH JUMP in 1946-47 Admiral Byrd ... found warm water lakes in Antarctica. Yes, . . and tell us about the Hollow Earth. It has been scientifically calculated that will be more than offset by the melting. Why isn't the ice breaking apart all around the Antarctic. Dirr; obviously because some parts of the ice around the Antarctic are more prone breaking up than other parts because of differences in local geology, structure, thickness of ice, air temperatures, local climate, local geothermal activity, etc. Given those difference, it would be a huge mystery if the melting and breakage happened evenly and in the same amount around the Antarctic and all at the same time! Obviously, any CO2 induced warming of climate would add on top of natural causes of ice melting and breakup and generally tend to exacerbate ice melting and breakup. You still haven't explained why natural and man made causes are mutually exclusive i.e. why they cannot both simultaneously contribute. Well, Operation High Jump really took place. I do not subscribe to hollow earth, flat earth nor Stable Earth theories. Why are we concerned with minor fluctuations in ice levels in Antarctica? Here we have video evidence that warm water lakes existed in Antarctica in 1947. ... However, Today we are told that antartica has no surface water. Perhaps the temperature goes up and down periodically with time? Maybe even on larger time scales, it goes ice free ... and has double the ice. We are not concerned with 'minor' fluctuations. We are concerned with the major melting of ice and the resulting sea level rise in the future that will harm future generations of humanity if we do nothing about it now. Fortunately, most of us have the wisdom, compassion and the desire to prevent such preventable harm to our future generations and I am optimistic that humanity will eventually go all renewable and prevent an unimaginable significant potential global disaster and do so before it is too late. Our concern for a disaster will stop it happening. "unmanageable significant potential global disaster"
You definitely must say hello to your twin for me, because you are too dumb to be one person. The fact is, and backed be all the reporting, this is only happening where there is geothermal and seismic activity, which so far has been found along the rift in Antarctica. Fortunately, most of us have the wisdom, compassion and the desire to prevent .. So, tell us when did you stop burning fossil fuel? Where do you get your food and how is it grown and delivered to you without fossil fuels? Wake me up when there are lakes in Antarctica again. "Wake me up when there are lakes in Antarctica again." The only reference to 400 I could find was subglacial lakes. That is not what is shown in the 1947 footage. The footage states that they found fresh water lakes at 38 deg F.
Seriously? The lakes are still there, at least as of 2009 - http://www.montan...0038.pdf . They may be larger now since the antarctic ice melt is accelerating and providing more fresh water feed. My guess is that since they're partially fed by seawater that probably helps keep them from freezing (though some do freeze in the winter). Googling "bunger hills", it appears that this is one of those conspiracy theories (the government is keeping it secret ;), even though the youtube links are of a TNT documentary. Just another made up controversy. Just because I have the desire to do something about it doesn't mean I can. Obviously, I am just one individual with limited power. But, despite my limited individual power, I have been doing what little I can; I use the recycling bin; I save what I can on energy use; I am vegetarian which reduces my carbon footprint. However, sufficient numbers of us have compassion and the desire for humanity as a whole to prevent future disaster. The individual power is little but humanity's power is much. Thought all he did was flyover. How did he know it was freshwater? When ice melts it turns to freshwater not salt water. Unless the geology just happens to be such that the lake has a channel/connection to the ocean such that sea water tends to flow from the sea through that channel/connection and into the lake, it should stay as freshwater. One of the most massive scientific lies ever recorded is about to break off from a vast accumulation of propaganda and melt away. philstacy, we already disproved "WMD!". Are you referring to "Make America Great Again"? That climate models which fail to accurately match historical data can predict long term climate changes and that, without any experimental evidence, long term climate can be controlled by carbon sequestration. Climate change is to science what Clinton Cash is to charity. "we" is an eight year experiment resulting in failure but it didn't get to Venezuela levels of failure because intelligence reasserted itself over feelings. Climate change is the WMD of "we" targeting the destruction of nations and capitalism so world bureaucratic control can be imposed. Making science great again. Thanks president Trump! "On White House website, Obama climate priorities vanish"
What is your source of information that logically implies that? Have you seen any actual predictions for historical data from a climate model? If so, where when and how? Are you a climate scientist? Or at the very least a physicist? Failure to give straight answers to these simple questions tells us you either don't know what you are talking about or are just making nonsense up which you know is nonsense. When they can't deny the thermometer, they attack models they do not understand. Well, first you need to grow a brain.
" Climate change is the WMD of "we" targeting the destruction of nations and capitalism so world bureaucratic control can be imposed." Yeah, that's it: I'm making myself more energy-independent so I can be enslaved? You live in a strange world. In a cult? The continuing dissolution of the Larsen Ice Shelf is evidence of global warming in and of itself. Arguing over each minor ice shelf's collapse is nit-picking BS. The big picture is, the entire freakin' thing is GOING AWAY. Move away from the sea or get flooded. Get over it. Your continuing ignorance of the facts is evidence of stupidity in and of itself. Fact the only place the AGW Cult can find globull warming is in West Antarctica where there is extensive geothermal and seismic activity. Larsen C is about to collapse. It's not *my* ignorance, apparently. That is, assuming it's not just you lying for Jebus again, @boracle. Thanks for confirming what a tard you are. When you grow a brain, try using a map to locate those ice shelves. No longer just sayin'... you're a tard. The maps are in the Wikipedia article and its references, and your juvenile attempts at insults are amusing and irrelevant. The AGW proponents seem to ignore climate history. There are maps that show the coastlines of Antartica free of ice. I believe that modern science did not chart the coastline of Antartica until the 1950s. Granted the Piri Reis map authenticity is disputed, but not debunked. Sea levels have risen 130 meters (400 feet) since the end of the last ice age (Pleistocene) and CO2 levels were much higher before the latter half of the Pliocene. Did early man cause the last ice age? There are natural factors that must be considered before man made factors can be considered. Volcanic activity, crustal deformations, Milankovitch orbital cycles, and solar cycle effects have not been fully calibrated with climate history. Can we predict volcanic eruptions or earthquakes? The article jumps to conclusions on AGW being the cause of the large portion of ice separating from Antarctica and fails to mention relevant climate historical facts. Here, get someone with a brain to try and educate you. Uh huh, gskam, the confirmed Pathological Liar, isn't satisfied with fabricating lies to embellish himself, he must lie to denigrate others. FACT: I never said "even the stuff sliding off the land would make the sealevel lower, not higher"
FACT: gskam has on many occasions claimed he had me on ignore, yet he is fabricating lies about what I said. What do you claim it says, @boracle? Half the job again. Juvenile, amusing, irrelevant, boring, and incompetent. My sincerest apologies. I gave you instructions to find someone with a brain to explain it to you, but then you do need a brain to follow said instructions. The so called 'scientist' in that link says none of the climate model "targets", by which he must mean what is conventionally called in statistics "point estimation " ( see https://en.wikipe...timation ) , by a particular climate model. The problem with that moronic statement is that anyone who knows about models like I do will tell you THERE IS NO SUCH "TARGET" for the climate model. That's because climate models are NOT SUPPOSED to give a single point estimation but rather a range of probable possible outcomes contained within a finite narrow range of values. In other words, he is talking nonsense and it wouldn't surprise me if he is paid by the oil companies to say such lies. So first you need to grow a brain. ...by a particular climate model. ...are reached by a particular climate model. The problem with that moronic statement is that anyone who knows about models like I do will tell you THERE IS NO SUCH "TARGET" for the climate model. That's because climate models are NOT SUPPOSED to give a single point estimation but rather a range of probable possible outcomes contained within a finite narrow range of values. My God, you are really just a braying jackass and so proud of it. You Chicken Little idiots, when faced by any intelligent facts that exposes the lies of AGWism, you just can't help but parrot what you have been fed by the cult -- you are paid by big oil. The target is the real world, and it demonstrates precisely how inaccurate everyone of the over 100 climate models are. Seriously, find someone with a brain to explain these things to you, since you are incapable of growing one. it wouldn't surprise me if he is paid by the oil companies to say such lies. It is beyond astonishing just how ignorant these Chicken Littles are to parrot this line that has been fed to them. I have never gotten a response to the question - When did they stop burning fossil fuels. So, if they are so against fossil fuels and yet pay oil companies for the privilege to burn it, then why would oil companies need to pay anyone to spread lies? Antigore knows we are now stuck with what we were given and have to engineer our way out of it, I have started with the PV and EV, and will add batteries in a year. This transition will happen so fast, the Deniers will be left with their Diesel polluters. How did antigore and Trump get identical ideas regarding AGW? Sorry, @boracle, no ticket, no laundry. 2. Support it with a link. Monkeyyyy goracle i see that airhead of yours is still taking in more air.... still copying words from my past paragraphs trying to turn it against us, but instead backfiring it all onto yourself as always. You Still can't understand science, You still back your claims with nothing but HOT air, and you still boast about how you don't care if the earth is destroyed by fossil fuels, that means YOU, and your 10 socks above, so basically YOU don't care about the people living and breathing on this earth. And everyone sees it, have seen it and will be seeing it forever to come. Sorry @Da Tard, no brain, no intelligence. 1. Find someone with a brain. 2. Get them to educate you. So when you are proven wrong about science by a scientist, you respond with pure unintelligent insults without even a mere attempt at a counterargument, rather than learn something new. That shows us all what kind of person you are. you respond with pure unintelligent insults without even a mere attempt at a counterargument, rather than learn something new. There you go again, the braying idiot. You suggested that Prof. Christy must be payed by oil companies to spread lies, a line commonly brayed by the Chicken Littles when they are left dumbfounded by the truth. I cannot counter what you claim is an argument, since I don't speak jackass. You don't speak jackass, you eat,drink,breath, live jackass monkeynuts, for the past 2 decades you've been trolling the site you were not able to counter ONE claim with any sensible let alone credible answer, still you keep stooping lower and lower, you'll be kept in the ring jumping up and down for that banana everyday. like you educating your own socks to be dumb trolls, aaa yes, they don't have brains since they are your socks, and your's is filled with hot air. You suggested that Prof. Christy must be payed by oil companies to spread lies,. You lie. I never said/implied this. I never said he "must" be payed. I CLEARLY said it "wouldn't surprise me" if he was paid. "wouldn't surprise me" ≠ "must"
Or must I educate you into the meaning of the word "must" and the words "wouldn't surprise me" and explain in what way the two meanings are different? Again and again, when he losses the argument, his only 'defiance' is straw mans, lies and insults. But he has still lost.